(Nanowerk Spotlight) Topological superconductivity is an interesting state of matter, partly because it is associated with quasiparticle excitations, which are Majorana fermions, i.e. particles that are their own antiparticles, obeying non-Abelian statistics and therefore being of prime interest for topological quantum computing. A well-known example are chiral superconductors with px±ipy-wave pairing of electrons into a condensate of Cooper pairs, the carriers of superconductivity. px±ipy pairing is so far verified in superfluid 3He, and is supported in strontium ruthanate by tetragonal symmetry of the crystal, but there is an increasing number of emergent hybrid systems with the same topological properties as a chiral p-wave superconductor. A chiral superconductor is one in which Cooper pairs can rotate either clockwise or anticlockwise, so that their orbital angular momenta align either upwards or downwards, corresponding to px+ipy or px-ipy pairing, respectively. The spontaneous choice of one direction over the other breaks time-reversal symmetry, and the degeneracy of the choice forms a fertile ground for Majorana excitations. In general, Majorana quasiparticles are predicted to appear on edges of such a superconducting system and/or inside vortices – a localized whirlpool in the quantum fluid of Cooper pairs. Therefore, a key property of the chiral px±ipy-wave state is its double degeneracy in the orbital angular momenta. Usually, the system chooses the angular momenta of Cooper pairs either upwards or downwards, thus determining the chirality of the state. 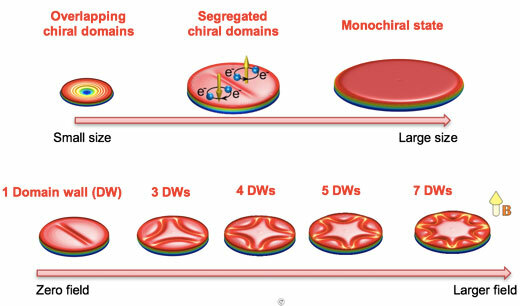 Still, coexistence of spatially separated domains of different chirality is possible, at the cost of some interfacial energy to form chiral domain wall – a topological defect entirely different from the vortex. Although the chiral superconducting state seems probable in multiple systems of current interest, chiral domains have never been observed directly. It should be specified however that chiral domains are expected to be no more than a few microns in size, as the energy cost associated with a chiral domain wall grows with its length. For this reason, a team of researchers from the University of Antwerp in Belgium suggested to consider mesoscopic samples, confined to the energetically favorable domain size, as a suitable platform to verify and potentially control the chiral domains. "The idea is fairly straightforward, but leads to an entirely novel phase diagram for confined chiral superconductors in particular, and also for mesoscopic superconductors in general," says Prof. Milorad Milosevic, the team leader. As further specified by Dr. Lingfeng Zhang, the principal researcher on the project, the main novelty is in the revealed states comprising multiple domain walls, here stabilized by the sample boundary, with the number of segregated chiral domains increasing with an applied magnetic field (as exemplified in the figure). By tuning the confinement, temperature and magnetic field one can therefore control the overlap/segregation of the chiralities, as well as the length and the number of the domain walls. Since the latter act as unconventional Josephson junctions between domains of opposite chirality, and recalling the susceptibility of the system to Majorana excitations, these confined topological superconductors may find applications in both first and second generation of quantum tech. The Antwerp team reported on these findings in the American Physical Society's noted journal The Physical Review B ("ARTTopological phase transitions in small mesoscopic chiral p-wave superconductorsIKEL").